This photo is from a trip to Missouri during my final summer as an undergraduate geology student at Kent State University. In addition to a stop at Mammoth Cave on the way down and a personal tour of an active lead mine (I now have some great galena specimens), we spent a few hours at Elephant Rocks State Park. These giant elephant-sized granite boulders sit inside the park in Graniteville, MO. The granite itself formed about 1.5 billion years ago as magma cooled and crystallized. 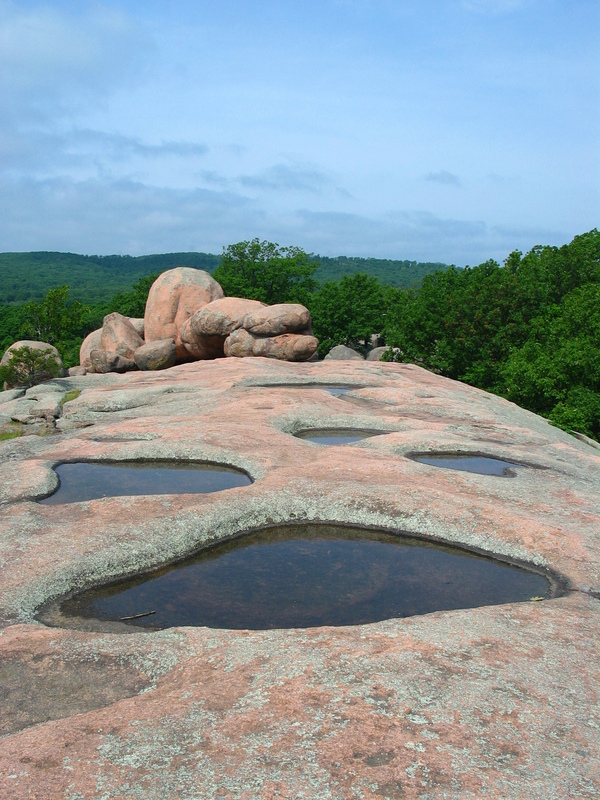 The giant boulders are a result of joints developing within the granite which was subsequently exposed at the earth’s surface where weathering processes “separated” the boulders from the rest of the rock mass. These boulders, as their name implies, reach some massive sizes. The largest of which, affectionately called “Dumbo“, is an astounding 680 tons! As evidenced by an abandoned quarry within the park, the granite at this location, and many others in the area, was exploited for a variety of uses, most notably monuments. The picture above was taken by a friend and fellow student, Brian Kelley, who is currently pursuing a PhD at Stanford. It doesn’t show the biggest boulders at the park, but it was my favorite picture from the location and, therefore, was more post-worthy in my opinion. Nice picture fellow Kent Stater! I know Brian, went through undergrad at Kent State with him. I’m still a student there actually, need to finish my thesis! I was working for the last couple years in Missouri and we visited Elephant rocks. A bunch of us Kent grad students were working on a dam about an hour south of there….that was a beautiful sight!